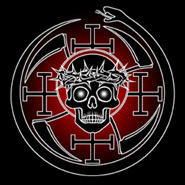 The Second Book of Master Falxifer will delve further into the Necrosophic mysteries of Qayin, but will also cast a Black Light on some crucial aspects previously hinted at and at the same time veiled in the first book of the Left-Handed Reaper. One of these crucial aspects concerns the identity of and the gnosis granted by the Hidden Mother of Our Bloodline, the Bride of Qayin. 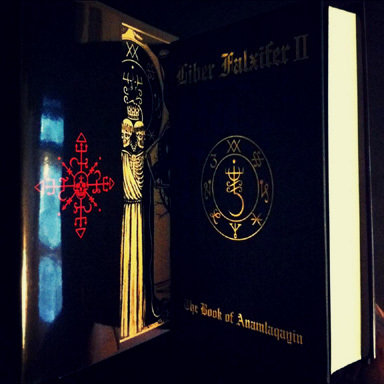 The Second Book of Falxifer shall continue where the First Book left off, as the purpose of all the publications of the T.F.C. is to make available the initiatic tools needed by Those of the Blood in order to awaken and set ablaze their slumbering Pneumatic Flames. The Second Book will once again present an extensive set of both worded and wordless manifestations of Sorcerous Gnosis and provide access to previously hidden keys to both low and high forms of Necrosophic Nigromancy, Necromancy, Ancestral Veneration, Herbal Sorcery and Daemonology and give new detailed instruction about how the powers of the insignias, talismans and fetishes of the Lord of the Harvest can be further employed in order to achieve both temporal and spiritual power, victory and transcendence, all by walking in the fiery and blessed footsteps of the First Ones who traversed the Paths of Nod. Some of the topics presented within the Second Book of Our Master are: esoteric discourses revealing the mythic foundation of our Qayinite Gnosticism, the Veiled Bride of Qayin, Her secret formulas of Calling and Names of Power, Her sigils and Keys of both high and low sorcery, the Dark Dead and their hidden and most fearful aspects, the cleansing, protective and empowering baths, the herbal formulas and activations of the 7 Key Sigils of Death, the Mysteries of 72 Black In Green, the powers of the First Tiller and the workings of His Green Point of the Skull, the rites of protection and concealment, the creation, loading and consecration of the aspect-specific fetish of the Lord of the Mound, the secrets of the First Dead within the Cult of Death and His Sigils of Conjuring, talismanic work against the law, the formula and ritual for the making of the Ensouling Tinctures of Qayin, the unified and transcendent aspect of the Twin-Flame of Sataninsam and the Grand Kliffotic Sigil of their Spirit, further teachings concerning the Mighty Dead, prayers, invocations and talismanic forms used for the channelling of the powers of both the soul and the spirit of Qayin and much more. 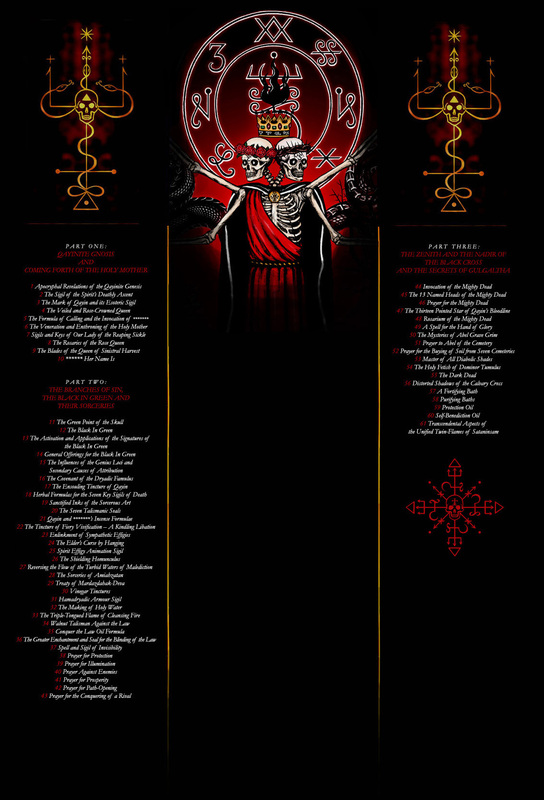 Those who have faithfully and correctly worked with and internalized the teachings offered in the First Book of the Left-Handed Reaper will, in this Second Book of our Holy Saint of Death and His Bride, receive the instruction needed to further experience the initiatic empowerments, blessings and curses of our Necrosophic Tradition.